There was a water mill where Penns Hall Hotel now stands for nearly three hundred years. For many years it was a wire mill, owned by the Webster family - Joseph Webster I came in the 1740s, Joseph Webster II died in 1788, leaving his widow Phoebe in charge until 1801 when her son Joseph Webster III took over. They were non-conformists, and felt threatened by the Birmingham Riots of 1791 when the mob seemed to be heading for Penns; Phoebe, her four children, the butler and the maid Mary Collingwood fled to Pype Hayes for safety. Joseph Webster III was only eighteen when he took over the business in 1801, but he was already active in public affairs. He was elected Warden of Sutton in 1809 and again in 1810, said to be the youngest Warden there had ever been, so he must have become an Anglican, as the office required him to take the oath of conformity. Accommodation for this workforce was hard to find, so Joseph III built a dozen houses on some of his land not far from the mill. These were three groups of four back-to-back cottages of a good standard for the time; one set of cottages next to Penns Lane survived until the 1980s. Some of the early occupants of these cottages were important to Joseph Webster - there was Mary Collingwood, who had been his mother’s maid, and Thomas Martin, whose son Charles was Plant Manager at Penns in the 1840s. A plaque on Penns Lane Cottages bore the date 1812, but some of the others were built a bit later, as a sum of £450 was spent on cottages in 1817. Joseph III died in 1848, and the business was carried on by his son. 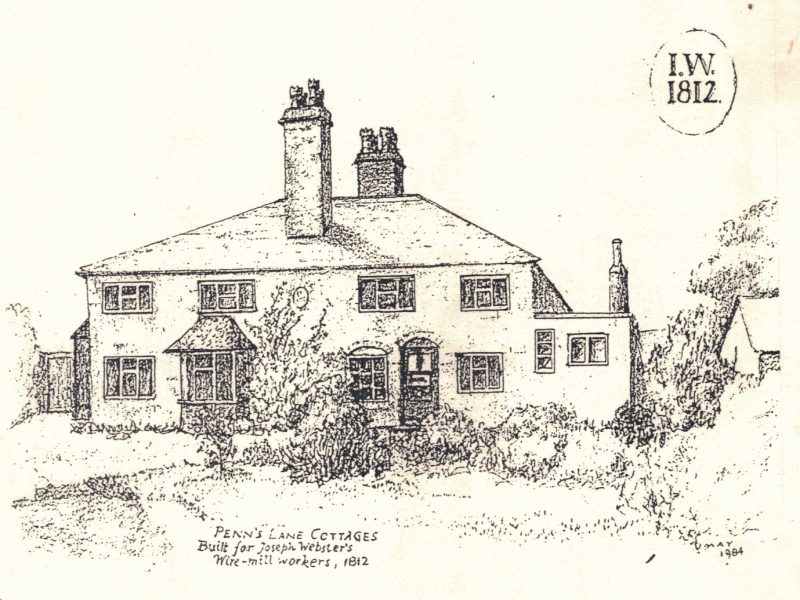 The 1851 census shows who lived in the four Penns Lane cottages. Joseph Martin, “Clerk in a wire manufactory” lived in one of them with his wife and three grown-up children Thomas who was a wire-drawer, James, an engraver, and Ann described as “Postmistress”, who ran Walmley Post Office from the house. Two other cottages were occupied by brothers who worked at the mill, William and Joseph Martin, both married with two young children. Another wire-drawer, William Knowles, lived at the fourth house. By the time of the next census, 1861, the wire mill at Penns had moved to new premises at Hay Mills near Birmingham, and only one tenant of the cottages was connected with the Penns business, William Clemson, a retired wire-drawer.